Cool and overcast in the morning. Mild and mostly sunny in the afternoon. Breakfast: Pie, apple slice and flavoured milk. Lunch: Muesli bars and chocolate. Dinner: Soup, Moroccan Lamb and chocolate. I got up at 6am after a good night's sleep with the intention of being on the road (at least to the bakery 500m away) by 6:45am, but ended up stuffing around trying to pack my gear in the most efficient manner. This always happens at the start of a hike and I'll have it down pat in a few days. 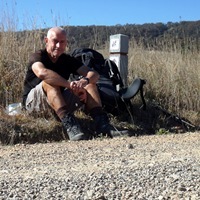 The pack was heavy, with three days food and 1.5 litres of Pepsi Max, not to mention the discretionary laptop and other electrical gear, but not overly so and I was sure I would adjust. I would guess it's about 20kg. I finally did leave around 7:15am and wandered up to the bakery (adjacent to last night's supermarket) where I bought some breakfast and ate it on a bench, somewhat disturbed by the guy cleaning the parking lot and surrounds with an industrial strength leaf-blower. At about 7:45am I set out westwards along the edge of the main road which I was sharing with plenty of early traffic. Apart from local commuters, this road was also the link from Yass to the Hume Highway, the main road between Sydney and Melbourne, so was carrying some long-distance trucks and cars as well. After a couple of kilometres, I was very happy to turn left onto the much quieter Black Range Road which was to be my route for the remainder of the day. The traffic went from a vehicle every ten seconds to every ten minutes and the traffic noise gradually abated though, for most of the morning, I could occasionally hear the distant low rumble of big trucks tackling the hills on the Highway out of my sight to the right. The road was sealed at first which made the walking quite easy, though I didn't want to use my trekking poles on the hard surface and so missed out on using my arms to share the heavy load with my legs. The road changed to gravel later on and I enjoyed the very peaceful rural countryside. Cars became even less frequent and, although I passed plenty of farmhouses, felt like I had the place to myself. Some of the farmhouses bordered on being mansions with huge gates, drives and machinery sheds, while others obviously dated from many years ago feauturing old verandahs, corrugated iron rooves and weatherboard cladding surrounded by rusting old cars and farm machinery and adjacent to tottering farm sheds. Not much had changed for them recently. I imagined that, in years gone by, swagmen would have travelled this road as I was and visited these very farmhouses looking for work and food. I stopped at a "Rest Area", comprising a single bench off to the side of the road, for lunch around noon and savoured the peace and quiet in the shade of large gum trees on what had become a pleasantly warm day as I read the Sydney paper I had picked at breakfast. The rest of the afternoon was spent travelling along Black Range Road up over the Black Range, a gentle winding climb and descent along the gravel road through very dry grazing country (I sense another drought is on the way) past sheep and cattle. Apart from these animals the only other signs of life were the flocks of native birds - cockatoos, galahs and parrots - which occasionally circled overhead or, in the case of the cockatoos, seemed to want to lead my way up the road from tree to tree. This is how I used to think of the real Australia when I lived overseas and it hasn't lost its charm or attraction to me. About 3pm, I reached The Captain Campsite, my goal for the day. It was a nice little treed area set off the road, designed for foot travellers and, as I expected, I had it to myself. It already seemed that the sun was going down and I set up camp and washed in the next hour by the orange rays of a setting sun before writing up my diary then having some dinner. I also tried, again unsuccessfully, to call the guy at the Burrinjuck Store who I need to ferry me across the Burrinjuck Reservoir tomorrow around noon. I left another message and hope he's available. I also called the small pub at the hamlet of Wee Jasper and booked myself a room for tomorrow night. By 6pm I was wearing three layers of clothes as the air cooled and, by 7pm there was a spectacular starry night sky with the Milky Way highly visible and an occasional satellite tracing a line through the stars. Lower down I could see occasional moving flashing lights which I suspect would have been planes descending towards Canberra Airport. The weather forecast is for more of the same tomorrow and I'm looking forward to another great day.